I lay back on the boat staring at the dark-hued sky, the moon was shining in all its glory along with a few twinkling stars for company. As our boat swayed in full swing and the cool breeze gently caressed my feet, suddenly a loud scream woke me up from my slumber, I was in the middle of the ocean, surrounded by water as far as the eyes could see. The crystal blue water looked black and scary. After an hour of trying my luck I had dozed off on the boat, but the celebration from the nearby boat enthused a new spirit in me and I started trying my luck again at jigging SQUID. It was in the month of May when we received an email inviting us to visit Terengganu for the second Annual Squid Jigging Festival that was being held in the month of June 2015. To be honest, until that time we had no idea about the state of Terengganu or about the squid jigging festival. As usual, our curiosity got the best of us and we googled for Terengganu and Squid Jigging. We came across numerous articles, blog posts and YouTube videos about the First Annual Squid Jigging festival. We found it to be quite interesting and fun, the event not only boosts tourism in Terengganu but also supports the livelihood of the local fishermen. After posing for a group picture with the other participants, we whisked away to our hotel where we had welcome snacks and drinks awaiting us. The organizers had taken care of everything and we had a hassle-free check-in. It was late afternoon so we had around 4 hours before the cocktail dinner. We went to a nearby beach, lazed around for a while before heading to the cocktail dinner planned. All the media personnel and bloggers were introduced to the event organizers and were also told about squid jigging techniques. Squid Jigging is the traditional way of catching squid in deep sea using a jig with no fancy equipment. The technique has been followed for many centuries now. The jigs are made of colorful plastic connected to metres of fishing line, which is wrapped around a circular disc, and each line is connected to two jigs. The fishing line is dropped to the bottom of the sea and you need to keep tugging the line till you feel a difference in weight. This is when the squid is stuck to the jig and you pull the line up quickly to catch the squid. The process requires a lot of patience, effort, and luck. This is how the jig looks like .. The Terengganu International Squid Jigging Festival starts from March of each year until October. This year Gaya Travel Magazine and Terengganu Tourism organized the Second Annual Squid Jigging Festival from June 2, 2015 to June 6, 2015. There were 120 media personnel from 28 different countries who participated in this year’s squid jigging festival – namely USA, Canada, Australia, New Zealand, Germany, Denmark, United Kingdom, Italy, Spain, Russia, France, Hong Kong, China, Taiwan, Japan, South Korea, Turkey, Cambodia, Vietnam, Thailand, Brunei, Singapore, Philippines, The Netherlands, India, Indonesia, Sweden and Malaysia and yes we were the only travel bloggers from India. 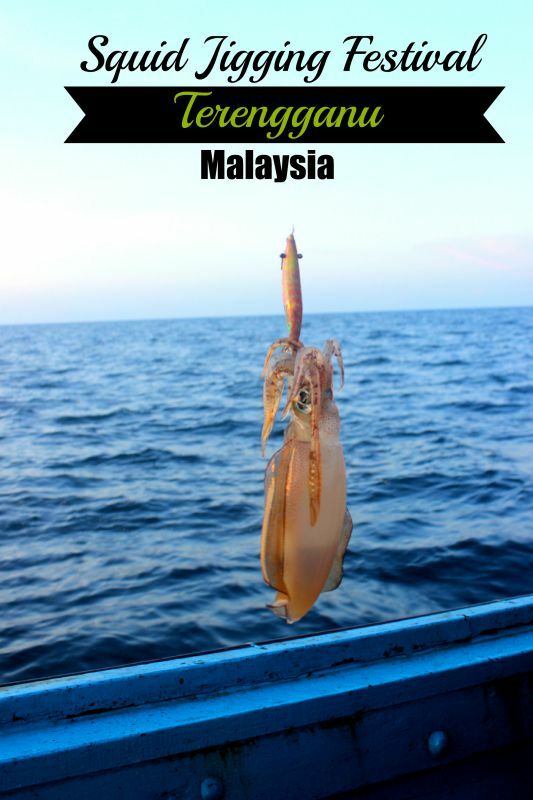 The first session of Squid Jigging was scheduled to take place in the deep sea off the Eastern Coast of Malaysia at the Marine park near Redang Island. All the participants were asked to gather near the Redang Island jetty at 4:00 PM local time, where the participants were divided into 12 teams. Each of the teams was assigned a boat and ours was boat number 12. The boats were typical small traditional fishing boats, which are used by the local fishermen for their fishing activity on a daily basis. It is said that the chances of catching a squid on a full moon night are high. So, on a full moon night and when the tide was full on, we set sail into the deeper sea for a little over an hour to reach a spot for squid jigging. Our boatmen dropped the anchor and we all were handed jigs. Initially, we all struggled and were not doing it the right way. Later our boatman demonstrated us the right way and we all started to try our luck at squid jigging. Unfortunately, the sea was choppy on that day and many of the participants were seasick by the time we reached the spot but it did not dampen the spirits to get a good catch. All the 12 boats were in close vicinity to each other and every time any of the participants caught a squid they squealed with excitement. Though by the end of 2 hours not many participants were lucky in catching a squid. In our boat, only one of the participant was able to catch a squid. By 8:30 PM we returned back to Redang Island jetty with the day’s catch. A gala dinner was organized for the participants where the day’s catch was served as one of the delicacies. And the stunning sunsets for company ..
That day we realized the hardship that every fisherman has to go through for their livelihood and how their source of income is so dependent on luck aka a good catch. The second session of squid jigging was planned off the coast of Kuala Terengganu where the sea is known to be much calmer and plenty of squids. This time the sea waves were not tossing our boat and in no time we reached the spot for jigging. Every boat was accompanied by an English speaking guide. As we sailed for deeper waters towards the squid jigging spot, we struck up a conversation with our guide, Ahmed. He helped us to translate and understand what the fishermen were saying. We got to know that fishermen sometimes stay at sea for days for a good catch. Sometimes they catch hundreds and sometimes just a few. In fact, Ahmed also showed us how to catch a fish using a hook and a line without a fishing road and shared with us a lot of tips about squid jigging and deep sea fishing and we ended up catching around 5 fishes. In the meantime Ahmed cooked Squid Maggi for us, it was the freshest squid that we had in our lives. The squid jigging session 2 was wrapped up with dinner and closing ceremony hosted at the Duyong Marina Hotel and Resort by Tourism Terengganu. The closing ceremony was graced by Right Honourable Dato’ Seri Haji Ahmad Razif bin Abdul Rahman. Away from the daily grind, amidst the vastness of the ocean, surreal sunset that provides the perfect backdrop, this unique experience was worth a lifetime. Squid Jigging tours can be arranged by resort or travel operators. 9F, Wisma Darul Iman, 20503 Kuala Terengganu, Terengganu. Looking at the hardship and struggle of the fishermen, we have started appreciating our life more after this trip. We are all ears, do share with us in the below comment box. That was a fascinating read! Whoa! That is a thrilling experience! A different festival 🙂 . Nice pics. Thank you for the comment Arun, indeed it was a very different experience altogether. True, it was great fun. From the post it’s clear how much fun it must have been. The squids and photographs look good too. Thank you, it was great fun and was a very different experience. It was an amazing time that we had, even we had not heard about it till we got the invite. 🙂 Thank you for your lovely words. I did squid jigging once. I was not lucky for the whole trip as I ended up not getting any. Lucky your boat to have gotten 15 squids. True, the first session we also did not get any and were heart broken. But the second session was truly amazing. We hadn’t heard about the Terengganu Squid Jigging Festival until we read your post. It does sound very adventurous. We have been to Malaysia before but probably then this festival wasn’t held then, looking forward to visiting one sometime soon.